Dear girls, here comes summer! In bright white and with pretty little neon-pink flamingos, this girls' underwear looks simply adorable! With a large flamingo motif on the hem and cool offset armholes and necklines in classic black, this shirt is not only a visual highlight, but also super comfortable and wonderfully soft thanks to the finest fine rib. 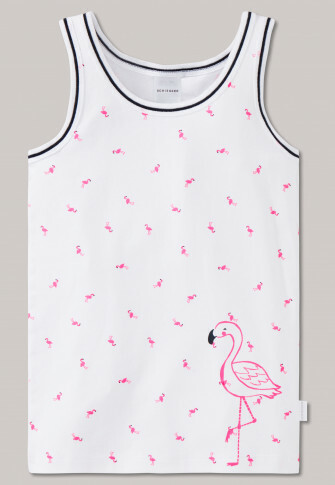 A must-have for all flamingo fans in the guaranteed best SCHIESSER quality!